Melvyn Bragg and guests discuss the rise of the Sikh empire under Ranjit Singh, who became Maharaja of the Punjab at Lahore in 1801 and united most of the Sikh kingdoms. Melvyn Bragg and guests discuss the rise of the Sikh Empire at the end of the 18th Century under Ranjit Singh, pictured above, who unified most of the Sikh kingdoms following the decline of the Mughal Empire. He became Maharaja of the Punjab at Lahore in 1801, capturing Amritsar the following year. His empire flourished until 1839, after which a decade of unrest ended with the British annexation. At its peak, the Empire covered the Punjab and stretched from the Khyber Pass in the west to the edge of Tibet in the east, up to Kashmir and down to Mithankot on the Indus River. 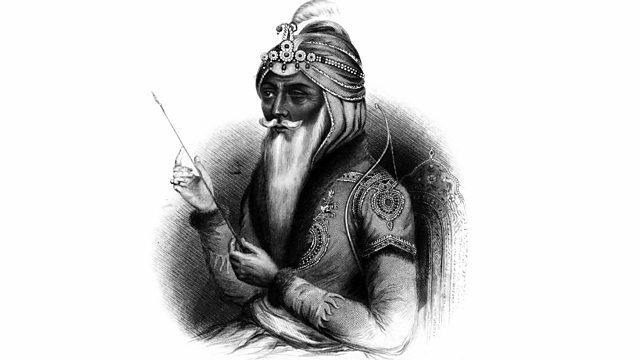 Ranjit Singh is still remembered as "The Lion of the Punjab." Browse the Victorian era within the In Our Time archive. Browse the 19th Century era within the In Our Time archive. Historical themes, events and key individuals from Akhenaten to Xenophon.